It is very thoughtful, moreover it makes a clear sense to get in touch with a life insurance firm to cover your dependents in the outcome of your unfortunate demise. The fact of the matter is there are potential problems when it comes to legitimacy of insurance companies and agents. 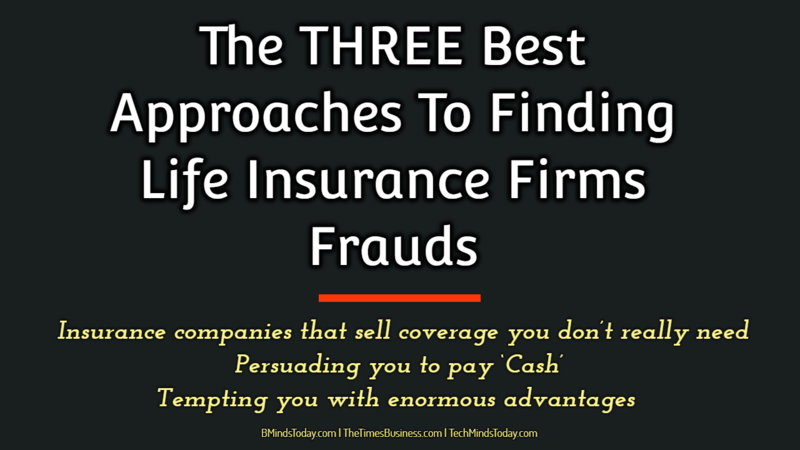 However, there are some effective approaches to follow in understanding and realizing whether a life insurance company is offering genuine deals or scamming with swindle deals. Here in the following section the 3 major approaches that help you in finding illegitimate life insurance companies are being discussed. A number of insurance companies thrive on the fact that most individuals are not fully aware of their life insurance needs. With very ordinary schemes, they try to sell you coverage that you might not need. On the other hand, they are profitable for the insurance companies. The insurance agents or brokers speed up the procedure so that you skip the fine print and sign up for a coverage that is not appropriate to your needs. The technique in many cases is used to play on your fear factor and sell you hefty insurance schemes, though you don’t have dependents. Experts and professionals strongly suggest that in any kind of scenario don’t agree to pay premium in cash to an agent or mediator. Further, make sure you get a proper receipt for the payment you made to the insurance agent. Beware of the illegitimate insurance firms because there are many fraudulent companies out there in the market posing as legitimate insurance agencies that extract hard cash from you in the name of insurance premium. They often request you to sign at blank spaces in a form, declaring you that it is just part of procedure or a formality. Their primary target is to get you into the premium that you don’t actually need. Once you have fallen for their artificial approach, you may be left without an insurance coverage. The sad part is that substantial number of victims only come to know of these sorts of scams, when they have met with some accident or any danger. Life insurance agents have a mode of promising you incredible benefits out a life insurance policy. For instance, life insurance agents might offer you attractive plans, with an assurance that the policy would run premium-free for a specific period. There are some agents who go further to offer you even more attractive deals. For instance, some agents may play it smart and offer you excessive discounts for signing you up for a new policy, while replacing an old policy. If you fall for it, you may face big trouble, because the objective of this trick is that the old coverage gets terminated and new coverage does not get initiated due to the bulky procedural holdups. Consequently, exposing you to risk without any life insurance coverage whatsoever. How To Choose Stocks From The Consumer Perspective ?